To begin with, I am a living, breathing, feeling human being. I know that may be hard for you to believe, but it’s true! I have thoughts and feelings, just like you. Well, not just like you, per se, but like most human beings. Next, let’s consider that I am very sick. And remember that stress makes my illness worse. And not having a source of income while also dealing with you and with lawyers is very much a stress-inducing situation. My main goal is to get my health back. My secondary goal is to get you to give me the money you owe me so that I can pay my rent and, importantly, pay for medical treatments that aren’t covered by health insurance. Your main goal is to save money by never paying me. Failing that, your goal is to save money by getting me to go back to work so that I no longer need your payments. Please correct me if I’m wrong about your goals, but for the sake of this letter, let’s assume they’re true. First, are you really saving money by denying my claim? In this process you are paying staff to handle the matter, lawyers to handle the legal aspects, and doctors to review my files. My guess is that many of these people are paid at a high hourly rate. Are you really paying them less than you would be paying me if you had just approved my claim to begin with? Next, you want me to work. If I work, you don’t have to pay me. From my file, you should see that I want to work also. I have a solid resume. I have held multiple jobs in the past, even while suffering from chronic pain. I have worked almost non-stop (except for school) since I was 14. When my symptoms got worse in 2011, I tried to continue working past when I was really healthy enough to do so. I continued because I wanted to work. So of course I’ll return to work as soon as my health allows it. This means that our goals now align: you want me to be healthy enough to work and I want me to be healthy enough to work. When I lost my health insurance, that slowed things down. I had to skip seeing doctors. I couldn’t pursue treatments. I had to stop taking a vital medication for a month, then spent another month recovering from the affects even when I resumed taking it. Gee, thanks for taking away my health insurance. Money is an issue. There are tests I would run and medications I would take, but I can’t afford them right now. If you had given me the payments you owed me, I would have done these things. Stress is very bad for me. It has been preventing my adrenals from recovering from my adrenal fatigue, and that in turn has worsened my thyroid problems. In fact, just in the last few months, since you jerked me around by delaying your decision on my appeal, my TSH has jumped from way too high for me to way too high for anyone. Stress has increased my fatigue and my pain. Stress has prevented me from making any strong strides towards improvement. Of course, I only have two sources of stress in my life right now: my health problems and this insurance mess. Why is this insurance mess causing stress? For a few examples, I don’t know if I can renew the lease on my apartment. I don’t know where I’ll be living in a couple of months. My bank account is almost empty. I have spent years and years of savings. I can’t go out to eat with friends, go to a museum, see a movie, or do most other social things, even on the rare days I feel well enough to do so. I’m not sure if I should be selling my car (but how I would I get to doctors?) or get rid of my cell phone. I don’t know if I should be applying for Section 8 housing. These are major issues that are in limbo, and have been in limbo for a long time. Oh, yeah, and I haven’t been able to file my taxes yet! Approve my claim and I’ll once again have steady health insurance coverage. Approve my claim and I’ll have enough money to run all of the tests I need and to take all of the medications that might help me. Approve my claim and my stress will go away almost completely. My adrenal glands can recover, and then we can treat my thyroid directly. You see, if you would just treat me with some decency and respect, if you would approve my claim and meet your deadlines, if you would communicate with my lawyer so that I know what’s going on, then we would all be happy: I could get health and go back to work, and you could save money. Now ask yourself: why aren’t you doing it? How dare you judge how I treat my pain! This has been a very bad pain week. I have a guess about why things are so bad, but it doesn’t help me to fix the problem. On our lovely pain scale (we all know that scale, don’t we?) I had a lot of time at 2s and 3s for a while. Lately it’s been at 5s and 6s. I can handle that. I don’t like it, but I can handle it. But when it was getting into the 7s and 8s and 9s and disturbing my sleep for several nights in a row, something had to change. Two nights ago I slept for only 4 hours, and it wasn’t great sleep. The pain woke me up often before getting so bad that even dozing was impossible. Long before dawn, I lay in bed and knew I wouldn’t be sleeping again that night (morning?) I thought about getting painkillers. I take them very rarely because I don’t like the side effects. I take them so rarely that my last set expired ages ago and I’d thrown it out. When their office opened, I could easily call my doctor and have a prescription sent to my pharmacy, but did I really want those side effects? And let’s face it, it only helps occasionally and minimally. I really hated that idea. Some of you may know that medical marijuana was approved in my state in last November’s election. I’ve written my views on it before, and they haven’t changed. So you may think this is a good option. Unfortunately, the regulations have not yet been written by the state group in charge, and probably won’t be for several more months. Without regulations, doctors won’t prescribe it and there are no dispensaries to sell it. Still, what other options did I have? Around 5:30am I was exhausted, in pain, and really pissed off at my body. First I emailed one of my medical practitioners and asked if the prescription painkillers would interfere with any of my current meds or supplements, just in case. Then I emailed a friend and told him about the horrible pain. I asked him to put me in touch with a friend of his who sells pot. I was going to write to a few more friends who might be able to help, but I was just too tired and in too much pain to type. I figured I’d write to them later. The doc wrote back that I’d have to discontinue a couple of things but that it wouldn’t be a big deal to take those painkillers. But I still didn’t want to take them. I dreaded it. Then the friend texted me. We spoke on the phone and he said he had what I needed and would give it to me for free because it was a tiny amount. He wasn’t kidding – the scale had trouble registering it. Even with the plastic bag it was barely a gram. But it was enough to see if it would work. I knew I wouldn’t go to jail for this. Even if I wasn’t protected by the medical marijuana laws, marijuana was decriminalized in this state a while ago. At worst there would be a fine. But there’s still the stigma. I told a couple of friends, though. People joked about it, not understanding that my goal wasn’t to get high, just to get away from the pain, and that it sure as hell wasn’t a funny situation to me. The thing is, I can’t smoke. My lungs just won’t go for it. So I have to eat it. I looked up online how to cook it, then went through the process. The last time I ate it, I got really paranoid (but it got rid of the pain!) Of course, it turns out that what I ate was incredibly strong and I didn’t know. This time I was dosing it myself. I did about half of what I figured I should, and just hoped it would work. Thankfully, it did. I didn’t really get high. I was a bit mellow and smiley, but that was it. The amazing part was that I wasn’t in pain! I walked down a few stairs and it didn’t hurt! I held the tv remote in my hand, and it didn’t hurt! And then the best part: I slept! I slept deeply for about 9 hours and it felt great! I slept without noticeable pain. Today, I feel like a new person. Sure, I’m in pain, but I feel a lot better just from having slept. I won’t have more pot today because, really, if I took it whenever I was in pain, I’d be on it all the time. But if the pain gets worse, if I can’t sleep, then I’ll have more in a day or two. And at least I know it’s a decent option with no unpleasant side effects. The interesting thing was when I told a friend about it this morning. She’s no stranger to pot. She smoked a bunch of times in college, and always thought it was weird that I didn’t try it until much later, in my late 20s. But as she’s gotten older, she’s gotten more conservative. She made a face (you know the type) and said how she’s not so sure about this whole medical marijuana thing. It’s not safe. It’s addictive. It shouldn’t be legal. I was shocked. I pointed out the supposed safety of prescription painkillers. And their levels of addiction. And their side effects. She stopped talking, but I don’t think I convinced her; I think she just knew she was wading into dangerous territory. It’s one thing to suggest a better treatment, but dumping on the best treatment method I’ve found for myself? She knew I was about to get very pissed off. So she backed off. But now I wonder… should I try to make her understand? Because if she’s judging me, she may judge someone else. And she won’t speak up when she hears someone else making the same judgments. I get very angry when politicians make these judgments, and it’s just as bad, or maybe worse, coming from friends who should understand my situation. I am not hurting anyone. But by denying a treatment, they are hurting me. How dare anyone judge how I choose to treat my pain? Especially when they themselves are not experiencing pain every single damn day of their lives. How dare they?!? If they have a headache, how will they feel if I take away their Tylenol? For that matter, what if I took away something that’s really not all that helpful or healthy but widely used, like coffee? Let’s make coffee illegal on the basis that it’s unhealthy and addictive, and then let’s talk about how people make decisions for their health. I bet a lot more people would be saying it should be a personal choice. Well, if coffee should be a personal choice, then so should medical marijuana. At the end of the day, this is my body. It’s my pain. If I can lessen the pain in a way that won’t hurt anyone else, then why on earth would that be a bad thing? And what would give you the right to judge me for it? Why can’t you explain everything about your body? My energy is low so this will be short. But I think short is fine – after all, we’ve probably all experienced this, so you know what I’m talking about. And if you’re one of the people who asks these questions, you’ll quickly see why you should stop doing that. Right now! When someone asks why I can’t climb a bunch of stairs, I say I have knee pain and they accept it. They don’t ask what causes the pain. When I say I can’t lift something because I have a “bad back” they accept it. They don’t ask what causes the back pain. When I say I can’t eat gluten, dairy, broccoli or anything else because it will make me sick, they ask why it will make me sick. They want the details. They want the medical explanation. From me! Why can’t you eat gluten? Why can’t you eat broccoli? It’s so healthy! What is it in gluten that makes you sick? Will you ever be able to eat X again? I’m so sick of those questions! I think my new response will be: the last time you had a cold, what exactly was happening in your body that made you feel lousy? What were the germs doing? Oh, you don’t know every detail of the biology of the human body? Well, ME NEITHER! I think it’s important to be a well-informed patient. I try to learn as much as I can. I know about the various thyroid hormones and why a Free T4 test is better than a Total T4 test. I’ve read about what every thyroid hormone is supposed to do in the body, how they affect organs, how they should interact with cells. Do I remember every detail? No. Just like I don’t remember every detail of what causes a leaky gut. Or a connective tissue disease. Or how my car engine works. Maybe my problem is that I am informed. I know a lot, so people expect me to know everything. I try to point out to them that I’m not a doctor and I didn’t spend 4 years in medical school, so my knowledge is limited. And yet, they expect me to have all the answers. What can I say? I DON’T KNOW! There’s nothing wrong with not knowing. But I shouldn’t have to constantly state it, repeat it, explain it, and justify it. I know what I need to know about my body. I know which foods to avoid. If you want to know more than that, look it up online or in the library. Then let me ask you about it in 6 months and we’ll see how well you remember it. It was the scream that woke me up. It was a horrible sound, full of pain. a just a couple of seconds, but I definitely figured out the screams before I noticed the pain, and that surprised me. I looked to my open bedroom windows and wondered if I’d woken anyone up, even as I put all of my effort into not screaming again. I had a firm grasp around my knee and there was nothing else to do but wait. I don’t know what this is. It started happening about two years ago. It only happens occasionally, maybe once every 3 or 4 months. It only happens during the night while I’m asleep. And it’s excruciating. Unfortunately, I think it’s been getting worse. I don’t usually scream. Or even sit up. Whether it’s worse or not, it’s still just as mysterious. My naturopath and rheumatologist are stumped. When I told my father today, he asked if I’d seen an orthopedist. 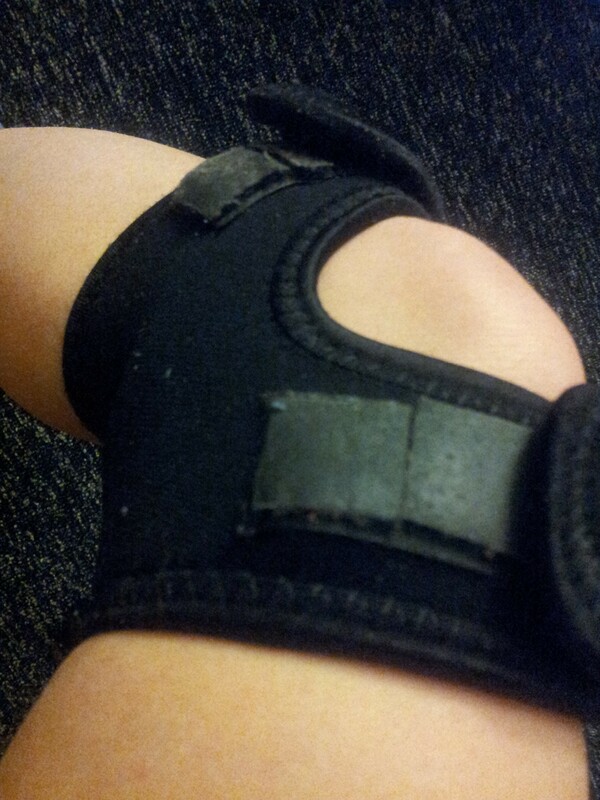 With all of my other problems, it never occurred to me to do anything about my knee locking up in my sleep. It’s horrible, but it’s rare, so why bother? Still, I’d like it to stop. Maybe seeing an orthopedist isn’t the worst idea. It was around 1:15am and I was cold. The windows were open and it was probably 20 degrees outside. I like sleeping in a cold room. But I couldn’t lie down. I couldn’t even move a hand to pull up the blankets. I had to hold onto my knee because if it moved a bit in any direction, the searing pain would just be too much. After more than 20 years of chronic pain, this was the worst I’d ever experienced. The memory of that initial pain has been haunting me all day. But at that point, I just wanted it to go away. Then I was aware that I had to go to the bathroom. There was no way I could get off the bed, though. After a while I felt into a fitful sleep. I had weird dreams. I dreamed about Downton Abbey. I just watched the first season this week and it was in my head. I think my brain was mostly trying to not think about my knee. I dreamed about the email I would write to my friend, canceling today’s plans. I dreamed things that made no sense at all. And I dreamed about pain. I woke up too often, but at least I did get some sleep. I managed to keep my knee straight. Every time I shifted, it hurt. I wanted to roll over, but gravity’s effect on my knee was too painful. It was a lousy night. I knew what to expect in the morning. Each time this happens, my knee hurts a bit the next day. I stay off my feet, and the following day it’s fine. I hated to cancel my plans for tonight, but they involved walking to the T, riding the T, and then sitting in cramped theater seats for a while. It was unlikely my knee could handle it, but I held out some hope. For some reason, though, my knee wasn’t just achy today, like all those times before. Today it was painful. Really painful. I’ve spent little time on the computer, because it hurts to sit in a chair where my knee can’t be straight. I mostly sat on the couch with my leg up today. But no matter where I was sitting, even with a brace on it, all would be good for a bit, and then WHAM! PAIN! It’s disturbing, and it’s one of the reasons I know this is getting worse. It was a frustrating day. I couldn’t do my errands, of course, but I also couldn’t do things around the apartment, like laundry. It was a day of reading, tv, reading, tv, tv, reading, and tv. On the other hand, the pain has been a nice distraction from my other recent problems, so I guess that’s a silver lining. Over the years my pain has come down on the pain scale. I’ve been thankful for my 2s and 3s. I’ve been glad my 4s and 5s weren’t worse. And today, as I keep feeling twinges of 5s, 6s, and 7s, I keep remembering last night’s 9.5 and I hope I don’t experience that again any time soon. And I wish none of us ever would. Self assessment is never easy, and it’s certainly not accurate. This can be true for the way we look, the way we act, and the way we speak. Lately, I’ve been thinking about it in terms of my health. First, there’s the vague stuff. If I’m feeling good on the day I see the doctor, I’ll focus on my progress. If I feel bad, I’ll focus on the setbacks. That’s just natural. At 3pm Tuesday the doctor may make one assessment of me, but at 11am Wednesday it would look completely different. It’s hard not to have a selective memory based on mood, especially when brain fog is already an issue. Of course, that also doesn’t account for the inability to differentiate periods of time in my mind. How have I felt in the last 2 months compared to the 2 months before? Are they kidding? In the middle of March, I’m supposed to compare January to last November? On my best days before brain fog I could sometimes use association techniques to make a wildly inaccurate comparison. But now? Forget it! Then there are the more specific ratings, like the pain scale. We all know the pain scale, right? You tell your doctor how much pain you have, with 0 being no pain and 10 being the worst pain you can imagine. They always seem to ask about the pain I’m experiencing that day, even though that day could be an aberration. And talk about subjective! I explained to my rheumatologist the other day that the pain started when I was a kid. After all these years, after experiencing new levels of pain, after gaining the perspective of an adult, of course my pain scale has changed. My 17-year-old pain 8 is now only a pain 6 or so. I report a lot of pain 2 and pain 3 days now, and even some pain 1 days, but the same pain 15 or 20 years ago would have rated at 4 or 5. There’s no good way to reflect that in the medical record. And there’s no objective test for it. I’ve heard of people using a similar scale for fatigue, but my doctors haven’t suggested it yet. For that, they ask about how much activity I can do in a day and how I feel afterwards. Again, there’s a lot of selective memory there. I don’t like it, but I can’t help it. I’m only human, after all. And it’s just all too easy to forget about the walks I accomplished, or to ignore the days I wasn’t able to leave the house. I’ve had three medical appointments in the last week, and I think they each got incredibly different views on my health. Sure, it’s partly because they each know different things about me, we have different histories, and they focus on different things. And it’s partly because of the time of day I saw each, the distance I had to travel, the stress surrounding the visit, and how much activity I had done in the days prior. As always, it comes down to the idea that we just need to do our best. And that’s what I’m doing. I just hope it’s good enough. “Normal” stress is NOT healthy! I’ve been thinking about stress a lot lately. It was a big topic in the explanation of some test results I read this week. I’ve been feeling a lot of stress because of the disability insurance insanity and that’s thrown me into a setback. And of course, stress comes up constantly as I research how to fix my adrenal problems. But today it came from a different source. My symptoms started in the early 1990s, but my diagnosis came 10 years ago. I was working multiple jobs and letting my type A personality rule. I was also dealing with the end of a serious relationship. My doctor told me I needed to sleep more and stress less. I literally laughed when he said that. It was a joke, right? After all, if that was doable, wouldn’t everyone do it? It’s taken me many years, but I finally understand the roles that stress and sleep play on our health. I understand how important they are. Having seen the light, I’d never go back. Sadly, most people haven’t seen the light. Yet. As I read more and more about autoimmune disease, adrenal fatigue, etc., I realize that while our bodies can handle a certain level of stress, most of us take on more than that level on a regular basis. And that’s the “normal” that J referred to. Not being able to handle the stress that everyone else does (or that they say they do,) she said, “makes [her] feel like a loser.” See, she thinks that being stressed out all the time, working constantly, taking on too much, is “normal” and that she should be able to handle it because everyone else appears to. Well I’ve got news for J and for everyone else who believes that. Our bodies were not designed for that level of stress. Besides that, you can never be sure how much stress someone else really has. What they say may not match up with the reality. And you don’t know how well they’re handling it. I have a friend, R, who does so much. He works a lot, does a ton of side projects, and is planning a wedding. He loves it and he’s happy. He doesn’t think it’s stressful at all. You’d think he’s handling it well. But I’ve been watching him put on an unhealthy amount of weight. Other people drink too much. Others become sick regularly (I bet you have that one friend who catches every cold that comes along but is otherwise healthy, right?) Some live perfectly healthy lives, but then die young. You just never know how someone else is really handling their stress. And by the way, you can’t control your own exposure to stress entirely. The one thing you can control is your response to the causes of stress. As for me, when I got diagnosed I quit all of my jobs and rested for several months, then started a 9-5 work schedule. You may have to leave an unhealthy relationship, quit a demanding job, move to a more relaxing environment. Maybe you need to start meditating, writing in a journal, and taking deep breaths regularly throughout the day. The best way to handle stress is different for everyone, but I think it’s vital that each person figures out what works best for them. A difficult one for me is not letting other people’s stress influence me. When a loved one is hurt, it’s hard not to get stressed out, but I’m talking about the more superficial kinds of stress. That’s why I try to do my taxes long before the deadline every year – when everyone else is stressing out in mid-April, I don’t get swept up in their hecticness. In our culture, though, it’s considered a good thing to be constantly busy. People compete to be the busiest. Like, if you’re not busy, then you’re not important or you’re not doing enough. Ask someone, “What did you do last week?” and they start listing off so many tasks that it seems impossible they did it all in such a short time. Would someone say, “I read a great book, watched some tv, and played with my cat”? I doubt it. I mean, I think it would be great, but I’ve never heard that before. Instead, people try to sound busy all the time. More than that, they feel they should be busy all the time. That’s unhealthy! The truth is, you’re actually smarter than everyone else if you take some time to yourself, read a book, write in a journal, and get some exercise instead of working an extra 10 hours. Even knowing that, I find it hard not to get swept up in their attitude that more is better. After a lot of practice, I’ve learned how to avoid infection with that attitude, but I see that J and most of my friends succumb to it. And while we’re talking about the office falling apart without you, or a friend not being able to get by without you, or whatever, consider this: how well will they do if you let yourself fall apart? If you don’t take care of yourself, then what will happen? On the other hand, if you take the time to take care of yourself, you’ll be a better employee, friend, parent, etc. Ten years after I laughed at that doctor I now see how much I was harming my body. Unfortunately, I did a lot more harm before I realized what was happening. Now that I see it, I’ll never go back. I just wish everyone else could see it too. There are plenty of other sources for tips on dealing with stress. There are web sites, books, classes, and more. And you can easily read up on the biology of what happens to our bodies when we experience stress. That alone could be enough to convince you. I cringe every time I read about it. But right now, I just want people to understand that it’s not good for us. And that working more, doing more, being more, isn’t what makes us happy. So that means that many of us are measuring ourselves against an idea of “normal” that will ultimately hurt us. Let’s face it, this blog doesn’t have the readership to make huge change (but I do get excited as I see the numbers going up every week!) Still, if this helps just one person, I’ll be happy. So please share it with people you know who need to slow things down. And please share a comment here or on Twitter telling me how you’ve learned to handle your stress and/or what made you see the light. The more examples we have, the more we can help others. Disclaimer: I’ve said this in other places but I feel it needs to be said again here: I’m not a doctor. I have no medical training. I am not offering medical advice. Everything here is my own opinion, not fact. You are currently browsing the Chronic Rants blog archives for March, 2013.